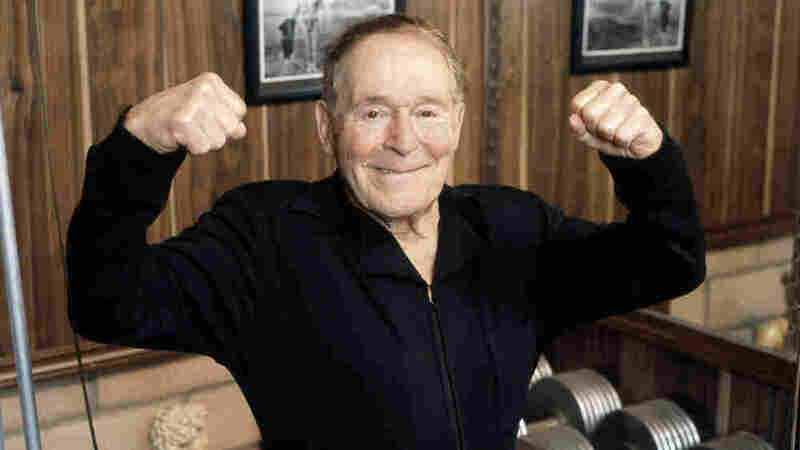 Remembering Jack LaLanne: Founding Father Of Fitness The man who became the nation's fitness conscience with his cutting-edge health studios and his daily TV show on exercise and nutrition remained as dedicated as ever to getting the country in shape. NPR's Tom Goldman found out just how much when he spent the day with LaLanne in 2004. Fitness pioneer Jack LaLanne, seen in this undated photo, was inspiring TV viewers nationwide to trim down and pump iron long before exercise became a national obsession. Before there was power yoga and Tae-Bo, there was Jack LaLanne, who devoted his life to making Americans fit and healthy. LaLanne, who died Sunday at age 96, became the fitness conscience of the nation after his daily TV show on exercise and nutrition debuted in the 1950s. Although the show aired for more than three decades, he is a distant memory for many Americans, a quirky part of cultural history. But up to the end of his life — he died of respiratory failure from pneumonia at his home in Morro Bay, Calif. — he remained as dedicated as ever to getting the country in shape. I found out just how much when I spent the day with LaLanne in 2004. I was told to be there between 7 and 7:30 in the morning. That's when LaLanne finishes his daily two-hour workout — not bad for an 89-year-old. Still, as I drove to his home in the rolling hills near the central California coast, I wondered how much old age had changed him from his TV days, from the image of a young and vital LaLanne, trim and muscular in his trademark one-piece jumpsuit. He was the perfect balance of chirpy optimism — "you can do it!" — and drill sergeant discipline, counting, forever counting as he led the exercises, "one ... two ... three ... four!" When I finally meet LaLanne, he is — what else? — counting his way through a morning workout. 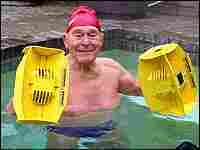 Wearing a bright red bathing cap and blue swim trunks, he's doing water resistance exercises in an outdoor Jacuzzi. The rippled weightlifter's physique is gone and there's an 89-year-old's sag here and there, but there is muscle definition in the arms and shoulders. When he turns away, his back is broad. And LaLanne is working as much as he ever did. "Turn it, turn it, turn it, turn it hard. Harder, Jack. Come on, harder!" LaLanne says, chest-deep in water. "I've only got one enemy: Jack LaLanne. … I usually hit the gym around 5 or 6 in the morning. To leave a hot bath, leave a hot woman, go into a cold gym takes a lot of discipline, boy, I'll tell ya. ... I never liked to exercise, but I like results." Even at 7:15 in the morning, he is crackling. It's like The Jack LaLanne Show all over again. His monologue veers from inspiration ("Anything in life is possible if you make it happen") to favorite tag lines ("Don't exceed the feed limit. Ten seconds on the lips, lifetime on the hips.") to his two dogs who eagerly circle the pool during his workout. The dogs are barking at him, and LaLanne grabs a tennis ball. "That's how they get their exercise, fetching the ball. Fetch! I can't afford to have a fat dog." LaLanne throws the ball. "See, they're happy now," he says with a big grin. And obviously, so is he. Whistling, singing, endlessly optimistic — LaLanne has mostly been this way for 74 years. Until his life changed at 15, he was miserable. He says he was a sugarholic who even considered suicide. "[I] tried to kill my brother, had an uncontrollable temper, set the house on fire," LaLanne says. "I can't believe it. I was a maniac. I was a psycho. Had these headaches all the day, couldn't stand the pain. All from sugar, sugar, sugar." When he was 15, LaLanne attended a lecture by a health nutritionist who told audience members they could be born again if they obeyed nature's laws: exercise and eat proper food. Young, impressionable Jack was hooked. The next day, he says, he stopped eating sugar, became a vegetarian and joined the YMCA in Berkeley, Calif.
Did he ever miss a day? Ever have any doubt about his lifestyle change? "Never, never, never," LaLanne says. "It's my religion. It's my life. That's why I was put on this Earth — I believe this — to help people. I enjoy it." LaLanne hasn't had a sugary dessert or missed a daily workout since 1930. On some birthdays, he has done stunts like swimming from Alcatraz Island to San Francisco in handcuffs or doing a thousand push-ups in 19 1/2 minutes — impossible standards for most, but the art of Jack LaLanne has always been that he doesn't expect people to be Jack LaLanne. Be yourself, he says. Find the time three or four days a week to get the blood flowing and the muscles working. I make the mistake of suggesting that can be hard in this busy world. "Stand up!" he commands. "Don't use your hands." "Sit down. Stand up. Now get your buttocks only about a half-inch off the chair. Now down. Just a half inch, though. A little lower, little lower. Now up. Now do it fast, fast. Up, down. Now do it slow, real slow. All the way down. You're doing a slow squat. Down, now come up slow. Now see, you're watching television and you're getting a workout. You feel that, don't you?" "Yes, I do," I say, starting to feel a bit overheated. With a satisfied look, LaLanne picks up his spoon and takes another bite of his whole grain and soy milk breakfast. He uses the chair workout on a lot of doubters. It's simple and effective, but there's science behind it. Following his epiphany as a 15-year-old, LaLanne got a copy of the classic medical textbook Gray's Anatomy. By the time he got out of high school, he knew enough about muscles and tendons and ligaments to create his own exercises and exercise machines. "Now this is the leg extension I was telling you about. See, it's all handmade, all hand-hammered?" Jack's wife, Elaine, has taken me to another part of their house. They call it the museum. Inside is the first leg-extension machine — Jack invented it in 1936 — and other original weight and stretching devices. Elaine does her daily half-hour exercise routines here, so it's a working museum, a perfect metaphor for Jack LaLanne. He's a man with a rich history, yet he's absolutely focused on the present, and he believes his work now is even more important than when he started back in the 1930s. He eagerly lectures about nutrition and fitness and promotes his power juicer, one of the few products he endorses. 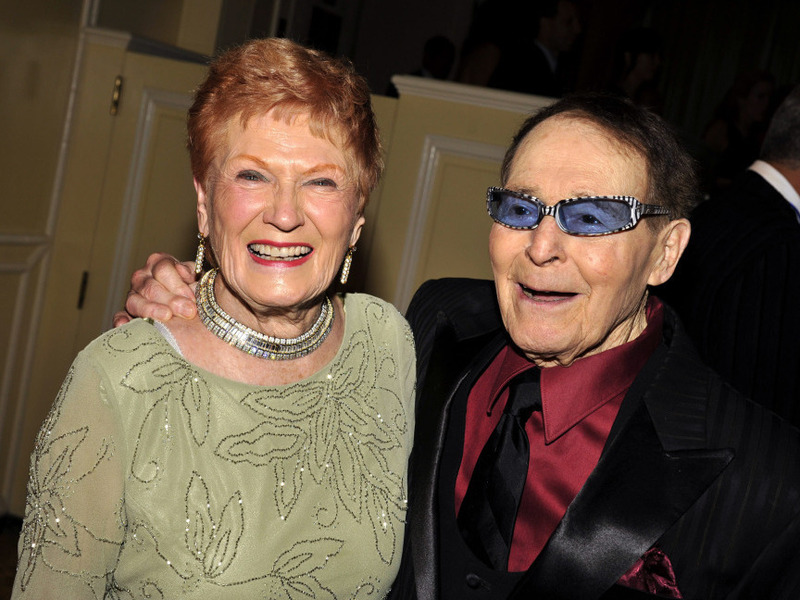 Jack LaLanne and his wife, Elaine, arrive for his 95th birthday celebration at the Beverly Wilshire Hotel on Sept. 24, 2009, in Beverly Hills, Calif.
Elaine, 78, does all the appearances with him. They've been together for 53 years. She initially thought he was just a good-looking California muscle man, but she says she got hooked by his intelligence and unwavering positive attitude. On their first date, they went to a nightclub where the piano player knew Jack. "And he said, 'Jack, come on over and sing a song for us.' So he sang, and he sang," Elaine recalls, breaking into song: "Because you're mine, the great na, na, na." Jack seizes the musical moment and starts crooning to his wife. "Because you're mine, the brightest star I see looks down, my love, and envies me because you're mine. Because you're mine, the breeze that hurries by becomes a melody. And why? Because you're mine. Because you're mine." Elaine tries to finish her story about the nightclub, but Jack, a man not to be stopped, continues in perfect pitch: "I never know for as long as I ..."
"He's singing the whole song!" Elaine says with a laugh. In 1990, Jack LaLanne was quoted as saying, "I never think of my age, never. I could be 20 or 100. I never think about it. I'm just me." Two years ago, before undergoing heart surgery, he said, "I can't afford to die. It would wreck my image." According to his longtime agent, LaLanne kept up his healthy, active lifestyle until the end of that very full life. Elaine LaLanne had the last, loving word. In a statement, she said, "I have not only lost my husband and a great American icon, but the best friend and most loving partner anyone could ever hope for."